Ever since eBook preorders were allowed at Amazon in the middle of 2014, many authors have utilized this feature at Amazon and other vendors to set a predictable launch date for promotional purposes. In an ideal world, the final edited and formatted eBook files would be ready weeks ahead of the preorder date so that you could set up the preorder product page at all vendors well in advance of the launch date. As authors in the real world, though, you know that the final edits and finishing touches are being placed on the eBooks days (and sometimes hours!) before the book is set to be released. Because of the short timeframe from when the book is ready for sale and when it must be published, it may be necessary to set up the preorder product pages before the book is finished. You will notice that you do not need a finalized eBook that has been edited and formatted to set up your preorder page at most vendors. However, BB eBooks recommends having the final edited/formatted eBooks for the two major aggregators that allow preorders: Smashwords and Draft2Digital. Let’s talk about each vendor. Anyone with a KDP account can set up a preorder at Amazon up to 90 days ahead of time. 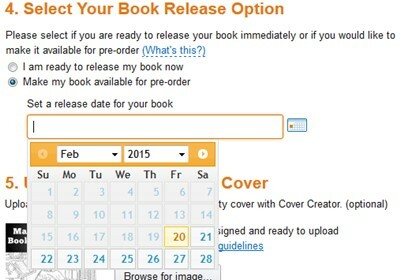 When you publish at KDP, on step 4, you can check the “Make my book available for pre-order” option and list a date. Amazon says you need to have the final edited/formatted eBook up 10 days ahead of time, but it’s actually 3 days. You have to upload a book file to complete the preorder process and get the product page. If you’re still working on your book, most authors will upload whatever manuscript they have—even if unedited. As long as the word count is roughly the same, the information on the product page will be accurate. Preorder pages do not have the Look Inside feature, so the reading public will not be able to see your unedited manuscript. Once the final book is ready and formatted, you can replace the book through KDP prior to preorder (recommended at least 10 days ahead of time, but it’s actually 3). Another tactic is to upload a previous MOBI eBook: the logic being that if the customers get the wrong eBook, they’ll blame Amazon rather than the author for releasing an unedited manuscript. Beware: We strongly recommend getting your final edited and formatted eBook no less than 10 days to KDP before the preorder date, since within the 3-day period before your book launches it gets “locked” in their system and cannot be changed. If you have the wrong eBook in Amazon’s system, it’s a total nightmare when the wrong eBook gets delivered to everyone who preordered. This results in many negative reviews and nasty emails from irate readers. Also, you cannot adjust the price of your eBook during this lockdown period. Anyone with a Kobo Writing Life account can set up a preorder at Kobo up to 180 days in advance. After you have successfully completed the four initial publishing steps for your eBook at Kobo Writing Life (i.e. 1) Describe your eBook, 2) Add eBook content, 3) Choose content rights, and 4) Set the price), you will arrive at the “Publish your eBook” section. 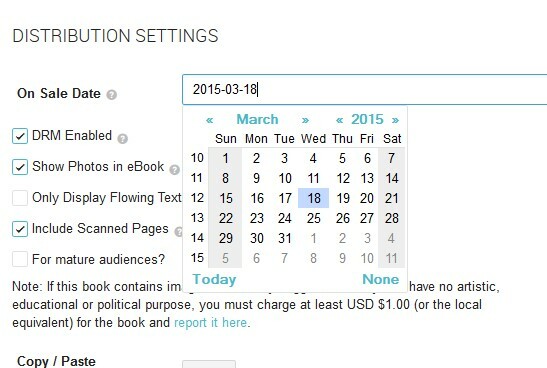 Once at the “Publish your eBook” section, there will be a little calendar that allows you to set a date if you would like to establish a preorder date in the future. Be sure that the “Allow Pre-orders” checkbox is clicked after you set a date. Once you publish, you will get the product page. You can go back and change the manuscript to your edited and formatted EPUB anytime. Nook Press only allows direct preorder functionality for “a small group of publishers” at this time and BB eBooks did not make the cut! Most authors use Draft2Digital or Smashwords to set up their preorder at Nook (see below). 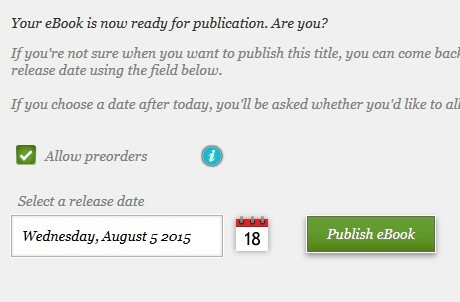 You can change the manuscript for your EPUB/PDF any time prior to the preorder date. However, they advise on their website: Due to variable processing times and other factors, Google cannot guarantee that a book will be available for pre-order sales during a specific time range. We recommend that you send us your book as soon as you are able. As it can take a matter of weeks to process a PDF or ePub file, please plan accordingly. 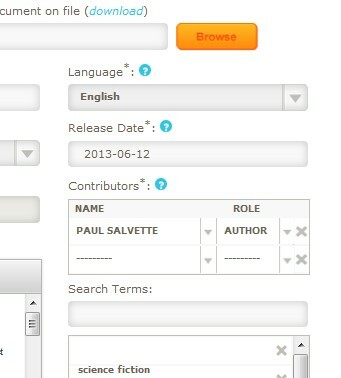 Beware: there is also another setting called “Publication Date” under the Settings tab, but this field does not have anything to do with preorders. Make sure to adjust the setting under “On Sale Date” as mentioned above. Unfortunately, BB herself does not think purchasing a Mac would be a wise investment for the company, so we don’t have direct access to iTunes Producer. However, you can set up an “assetless” preorder (i.e. not having a completed book file) via iTunes Producer up to one year in advance. You may need to contact their customer service team to enable an assetless preorder. They require the cover, metadata, and price. Unlike the other vendors you should not upload a dummy file (like an unedited manuscript or previous eBook). Also, you should disable sampling. Another way to get a preorder established on iTunes is through Draft2Digital and Smashwords (see below). Smashwords was one of the first aggregators to really push for authors to use preorders, and by going through them you can get preorder product pages set up at Nook, Kobo, and iTunes. 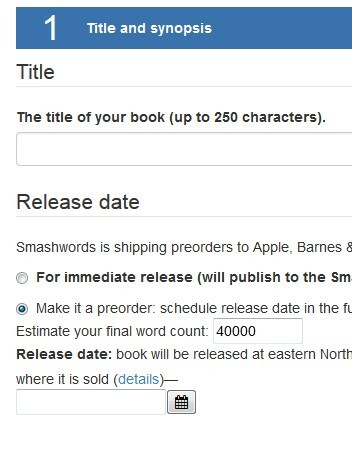 To set up a Smashwords preorder, go to “Publish” and in Step 1 click on the “Make it a Pre-order” button and set a date. You can set the date up to 180 days out. Please note that the eBook has to be approved through their team to get “Premium Status” first before shipping to Nook, Kobo, and iTunes. 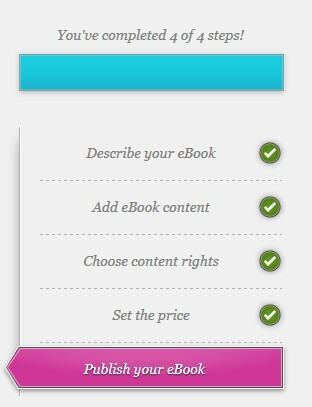 So, for Smashwords we recommend having a fully edited and formatted eBook prior to getting the preorder product pages.